"Knight's Tale" redirects here. For the 2001 film, see A Knight's Tale. 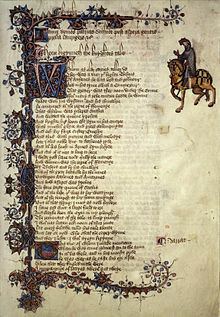 "The Knight's Tale" (Middle English: The Knightes Tale) is the first tale from Geoffrey Chaucer's The Canterbury Tales. The Knight is described by Chaucer in the "General Prologue" as the person of highest social standing amongst the pilgrims, though his manners and clothes are unpretentious. We are told that he has taken part in some fifteen crusades in many countries and also fought for one pagan leader against another. However though the list of campaigns, mentioned by Chaucer, is real, "and though it was perhaps just possible for one man to have been in them all, [it] is probably idealized." Chaucer's portrait of the Knight in the "Prologue" "is generally thought to show a man of unsullied ideals, though some see him as a mercenary." He is accompanied on his pilgrimage by the Squire, his 20-year-old son. The story introduces themes and tropes typically encountered in the literature of knighthood, including courtly love and ethical dilemmas. The epic poem Teseida (full title Teseida delle Nozze d’Emilia, or "The Theseid, Concerning the Nuptials of Emily") by Giovanni Boccaccio is the source of the tale, although Chaucer makes many significant diversions from that poem. The Teseida has 9,896 lines in twelve books, while "The Knight's Tale" has only 2,250 lines—though it is still one of the longer poems in the Tales. Most of the epic characteristics of the Teseida are removed, and instead the poem conforms primarily to the genre of romance; there are no epic invocations; the fighting and mythological references are severely reduced; Theseus' conquests, the assault on Thebes, and the epic catalogue of heroes fighting for Palamon and Arcite are all severely compressed. The tale is considered a chivalric romance, yet it is markedly different from either the English or French traditions of such tales. For instance, there is the inclusion of philosophical themes—mainly of the kind contained in the Consolation of Philosophy of Boethius—astrological references and an epic context. The tale that follows it in Chaucer's work is told by the Miller and also involves a conflict between two men over a woman. It is a direct antithesis to the Knight's, with none of the nobility or heritage of classical mythology, but is instead rollicking, bawdy, comedic, and designed to annoy the Knight. Two cousins and knights, Palamon and Arcite, are captured and imprisoned by Theseus, duke of Athens, after being found unconscious following his battle against Creon. Their cell is in the tower of Theseus' castle, with a window which overlooks his palace garden. The imprisoned Palamon wakes early one morning in May and catches sight of Princess Emily (Emelye), who is Theseus's sister-in-law, down in the courtyard picking flowers for a garland. He instantly falls in love with her; his moan is heard by Arcite, who then also wakes and sees Emily. He falls in love with her as well. This angers Palamon, who believes that he claimed her first. Arcite argues that he has the right to love Emily as well. The friendship between Palamon and Arcite quickly deteriorates over their competition for Emily's love. After some years, Arcite is released from prison through the good offices of Perotheus, a mutual friend of Theseus's and Arcite's, amending Arcite's sentence down from imprisonment to exile; but Arcite then later secretly returns to Athens in disguise and enters service in Emily's household, to get close to her. Palamon eventually escapes by drugging the jailer, and, while hiding in a grove, overhears Arcite singing about love and fortune. They begin to duel with each other over who should get Emily, but are thwarted by the arrival of Theseus. Theseus originally plans to sentence the two to death, but upon the protests of his wife and Emily, he decides to have them compete in a tournament instead. Palamon and Arcite are to gather 100 men apiece and to fight a mass judicial tournament, the winner of which is to marry Emily. The forces are assembled. On the night before the tournament, Palamon prays to Venus to make Emily his wife; Emily prays to Diana to remain unmarried, or else to marry the one who truly loves her; and Arcite prays to Mars for victory. Theseus lays down rules for the tournament so that if any man becomes seriously injured, he must be dragged out of the battle and is no longer in combat. Because of this, the story seems to claim at the end that there were almost no deaths on either side. Although both Palamon and Arcite fight valiantly, Palamon is wounded by a chance sword thrust from one of Arcite's men, and is unhorsed. Theseus declares the fight to be over. Arcite wins the battle, but following a divine intervention by Saturn, he is mortally wounded by his horse throwing him off and then falling on him before he can claim Emily as his prize. As he dies, he tells Emily that she should marry Palamon, because he would make a good husband for her. Palamon marries Emily, and thus two prayers are fulfilled. The First Mover or the Firste Moevere is a speech delivered by Theseus, spanning lines 2129–2216, bringing the poem's narrative to its close. The First Mover appears near the end of the poem, after the protagonists Arcite and Palamon have finished their duel for Emily's hand; Arcite is slain, and Theseus speaks to console Emily and Palamon as they grieve for Arcite. Theseus begins with a reference to the First Mover, the primum movens, or unmoved mover of Aristotelian philosophy creating the “Great Chain of Love”, the kyndely enclyning, or natural inclination, that holds the universe together in Medieval cosmology. He describes the inevitability of death for all things at their proper time, using the destruction of an oak tree, a stone, and a river as examples, and listing all the classes of medieval society as universally subject to death. He then shifts to a discussion of the proper way to respond to this inevitability of death. Theseus maintains that, since every man must die when his time comes, that it is best to die with a good name and reputation, on good terms with his friends, and having died with honour. Theseus's comfort to Emily and Palamon is that Arcite died in just such a manner, having acquitted himself well in a feat of arms. It is generally acknowledged among scholars that the First Mover speech draws on the philosophy of Boethius. What the purpose of the speech is, however, has been assessed variously. Some scholars maintain that the speech, with its Boethian elements, is not only representative of Boethian philosophy, but of Chaucer's own beliefs, and a reconciliation of Boethian and Christian philosophy, though this is disputed. The speech has also been read as a parody of Boethius's Consolation of Philosophy, as a narrative device simply conveying an idea from the Character of Theseus to the characters of Palamon and Emily, as a transition from a tragic character death to a happy ending, as a council of how and when to die properly, and even as an expression of disappointment in not only the events of the tournament, but in the divine order he describes. Richard Edwardes's 1566 play Palamon and Arcite is based on it, but the text of the play is lost. Another version of the story was performed in 1594, but this is only known from a reference in Philip Henslowe's diary. The Two Noble Kinsmen, a 1613 play co-written by William Shakespeare and John Fletcher, is based on the tale. John Dryden translated this story to a more modern language in the style of his time. Dryden's book is entitled Palamon and Arcite and is longer than the original text due to Dryden's own poetic touches. In Alan Plater's 1975 TV series Trinity Tales the story is transformed into a competition between two young men for the attentions of a barmaid. The story is one of the tales that inspired the 2001 movie A Knight's Tale, in which Chaucer himself is one of the principal characters. Adapted for the BBC's The Canterbury Tales in 2003. The names of the characters Palamon and Arcite are changed to Paul (Chiwetel Ejiofor) and Ace (John Simm), and the story is moved to a modern prison setting where the two men battle for the attentions of a prison teacher named Emily (Keeley Hawes). ^ Michael Murphy, Canterbury Tales. ^ Burrow, J. A. (2004). "The Canterbury Tales I: romance". In Piero Boitani (ed.). The Cambridge Companion to Chaucer (Second ed.). Cambridge: Cambridge UP. ^ Finlayson 1992, p. 128. ^ Finlayson 1992, p. 127–8. ^ Benson, L. D. "The Knight's Tale (general note)". Harvard University. ^ Murtaugh, Daniel (2000). "The Education of Theseus in the Knight's Tale". Selim. 10: 143–67. This page was last edited on 4 April 2019, at 18:23 (UTC).